According to mandated economic interest disclosures filed with the California Fair Political Practices Commission, during 2017 Assemblymember Jim Cooper (D - Elk Grove) received gifts and travel valued at over $34,000. The disclosure was filed on March 1, 2018, and showed the second term legislator representing the states 9th Assembly District, which includes all of Elk Grove accepted gifts, mostly meals valued at $4,008. Those gifts ranged from oranges from California Citrus Mutual valued at $8.65 to a gift reported with a price of $395.41 from the California Tribal Business Alliance described as a gift card, food, and lodging. The gifts came from a wide variety of interests groups across the political spectrum, indicative of Cooper's stances on a host of issues. On the left side, Cooper received a pair of boxing gloves and boutonnière with a reported value of $63.83 from Planned Parenthood Affiliates of California reflecting his support of reproductive rights to more conservative agricultural affiliated groups like Western United Dairymen to California Cattlemen's Association. The higher valued portions of Coopers report came from gifts of travel. During the year, Cooper listed 20 travel events where he reported either being a speaker or participating in a panel discussion that was valued at $30,290. Among the most expensive trips Cooper took was 12-day visit to United Kingdom, Ireland and Finland from the California Foundation on the Environment and Economy; a seven day trip to Maui, Hawaii from the Independent Voter Project with a value of $3,199; and a three day visit to Pebble Beach, California funded by the California Legislative Black Caucus with a reported value of $3,365. Cooper's travels took him to Napa, California on four occasions and Las Vegas three times during the year. The most frequent interest groups paying for Cooper's trips included the four from California Issues Forum, valued at $2,277; and three trips with a value of $13,800 from the California Foundation on the Environment and the Economy. Cooper currently draws a salary of $107,242 as an Assemblymember. 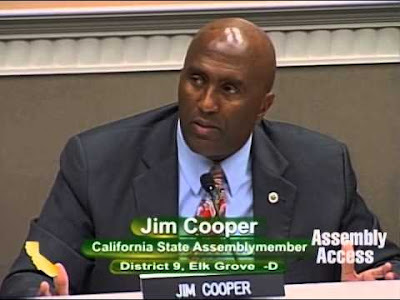 A retiree of the Sacramento Sheriff's Department where he served for 30 years, Cooper is drawing an annual pension of $177,082 as of 2017 as well as $9,453 from the City of Elk Grove where he served as a council member for 14 years. UPDATED March 15, 4 p.m. - The original story stated Cooper is eligible for a $183 per diem when the Assembly is in session, but he does not accept the stipend. Additionally Cooper does not accept the $9,453 CALPERS pension from the City of Elk Grove.